Since my sister was in town, we celebrated the holidays with our cousins by having a pizza party! Although I was hoping to make the dough, I ended up making my life a little easy and purchased pizza shells. 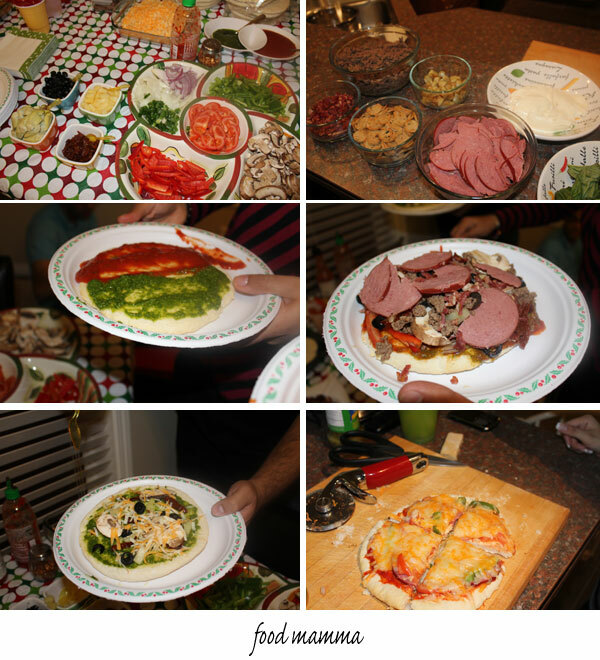 Everyone had the chance to top their pizzas with homemade pesto (nut-free for those with allergies) or tomato sauce and then tons of toppings. Meat toppings included spicy chicken sausage, beef bacon, ground beef and beef pepperoni. Veggies included peppers (green and red), onions (white, red, green), tomatoes, mushrooms, olives, artichokes, sundried tomatoes, pineapple, roasted garlic and basil. Everyone had a great time being creative when topping their pizzas. It was a fun idea and we will definitely be having another pizza party! Hard to believe a new year has begun. Instead of starting the new year with resolutions I can’t keep (give up chocolate? no way! ), I reflect. Reflect upon what’s important and what the new year can offer. What’s important is always the same – family. When it comes to family, I am the luckiest girl in the world. A loving husband, the sweetest little boy, amazing parents that I don’t know what I would do without, a great sister that I wish lived in the same country, if not city, wonderful in-laws and a close-knit family (uncles, aunts, cousins and their kids) that get together at least once a month. 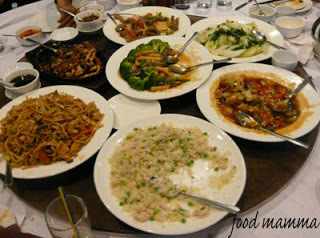 This month’s lunch was at a local Chinese restaurant – 24 of us in total, 6 under the age of 5. It was an afternoon filled with laughter, good conversation and a little bit of chaos. So thankful that I have these wonderful people in my life. Looking forward to a year filled with many family gatherings and celebrations! It was a wonderful Christmas. My sister who had been stuck in Europe because of all the flight cancellations finally made it here with her fiance. Although time with them will be short, we are so lucky to be spending the next few days with them. 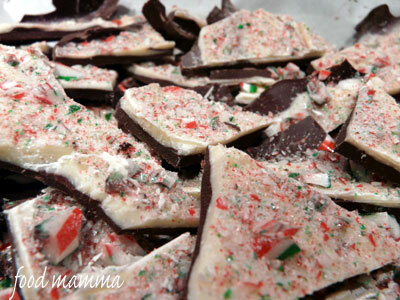 Around here, a fave of ours during the holidays is candy cane bark. With two layers of chocolate topped with crunchy candy canes, it’s a winning combination. Hope everyone’s Christmas was as sweet as ours! Melt the dark chocolate and spread a layer on parchment placed on a cookie sheet. Refrigerate until cooled. Melt the white chocolate and place on top of the dark chocolate. While still warm, sprinkle with crushed candy canes. Once hardened, break into pieces. 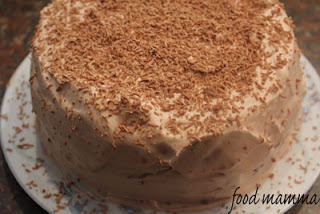 When we were younger, my sister and I loved it when my mom made desserts with condensed milk. We couldn’t wait to get our share of the sweet liquid. Sometimes we would open up a can and eat it like pudding. One of my favorite things to do with condensed milk is to make these squares. 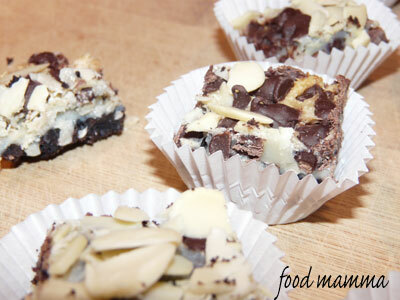 Very similar to Eagle Brand’s Magic Cookie Bars, these are even more sinful with a chocolate crust. Combine the crumbs and margarine and and press into the bottom of an 8″ x 8″ dish. Pour the condensed milk over the crumbs followed by the chocolate, coconut and almonds. Bake at 350 degrees for 30 minutes. 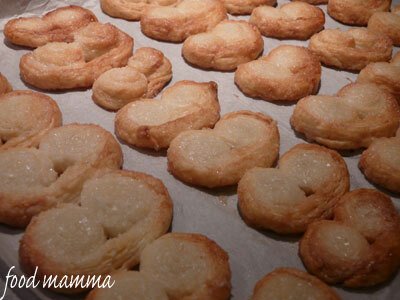 Baking continues with one of my favorites, whipped shortbread cookies. I’ve been making this recipe for years and can’t remember where it comes from. It’s a simple recipe with only 3 ingredients! 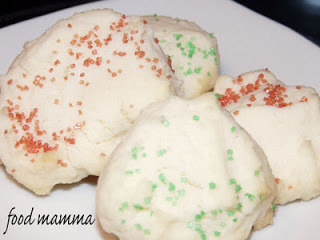 Whipping the dough for 10 minutes makes it light and fluffy and the buttery cookies just melt in your mouth. These cookies went fast and I know we’ll be making a couple more batches before the year is done. Cream the butter and icing sugar together. Add the flour and beat for 10 minutes. Bake at 350 degrees for 12 minutes. Makes 3 dozen small cookies. Well, it’s that time of year. Time for Christmas parties and tons of baked good. We may not celebrate Christmas religiously but we do celebrate the holiday season with close friends and family. Baking this year started off with the simplest of cookies. Made with only 2 ingredients, Palmiers are puffs of buttery sugary dough baked until golden. They look quite fancy, people will never guess they take only minutes to prepare. Unroll one sheet of puff pastry. Sprinkle generously with sugar. 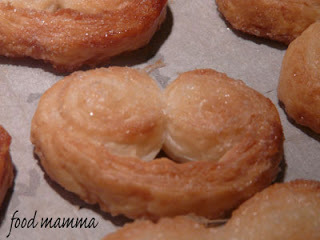 Roll the pastry from the horizontal ends into the middle. Refrigerate for 10 minutes and then cut the roll into pieces. Sprinkle each piece with sugar and place on parchment paper. Bake at 350 degrees for 10 to 15 minutes. After reading about it on blogs, twitter and even watching it on television, I had to see what all the fuss was about. 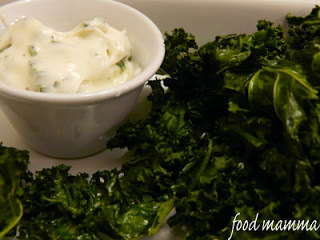 People seemed to be raving about kale chips. I couldn’t understand how so many could get excited about greens. Well, I understand it now! 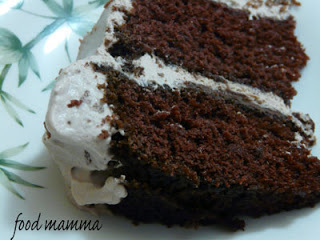 I made a batch last week and hubby and I polished it off in minutes. I made a couple more batches on the weekend for family and everyone loved it. The tough greens when tossed in oil and seasoning and baked turn into paper-thin morsels that just melt in your mouth. Check out recipes on the following blogs: Backseat Gourmet, Dinner with Julie, Gluten Free Girl as well as Giada’s recipe on Food Network. Great served with Basil Mayo (mayo, basil, 1 clove garlic, lemon juice, salt, pepper). This weekend we had the opportunity to go to the opening of Kayne’s Restaurant in Calgary. Kayne’s is a venture by Lux Restaurant Group and features a menu that was developed with Chef Michael Noble. Located on 17th Avenue, this modern-looking pub boasts a lounge area with a wall of flat screen tvs. There were so many great things on the menu, it was hard to decide exactly what we wanted to try. 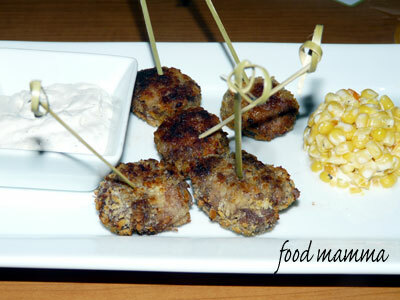 We decided to make a meal of appetizers and they were delicious! We started with the Bison Pops. These are indian-spiced bison meatballs served with a garlicky tzatziki. These skewers were exploding with flavour, we had to resist the urge to order some more. Being the cheese lovers that we are, we just had to try out the Crispy Brie. The brie was lightly breaded with panko and the warm cheese just oozed out with every bite. 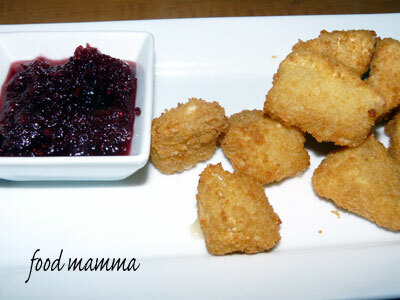 This was served with a sweet cranberry sauce and was fantastic! 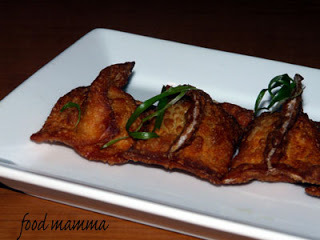 We also tried out the Seafood and Chicken Purses. These were fried wontons stuffed with a shrimp and chicken mixture. Another great appetizer. One thing that stood out in all the dishes was the amount of flavour! Great food and great service – we will definitely be back to try out the rest of the menu.